New India with Bullet Speed…! SEATS GRABBING: This Is One of the most interesting part of the analysis. Here we will see party wise analysis of seats earned. How the constituencies changed their MLA’s and how the total seat sharing took place. And which party grabbed the most and which lost the most. Unchanged seats: The red boxes show the seats that were successfully retained by their respective parties. And a total of 93 of 222 seats were retained. That means a total of 42% seats remained unchanged and around 58% seats changed their decision. This Indicates that around 58% constituencies were unhappy with the sitting representatives. Last time there were a number of Independents which have drastically reduced to 2. This shows that people of Karnataka has bestowed upon their trusts more on the Parties rather than on the Independent candidates. They lost 10-3= 7 seats to the BJP. The Only achievement of JDS would be gaining 5 seats from others keeping their overall loss by just 2 seats. The Biggest looser in the Battle whose 49 seats were transferred to only BJP. They got 0 from JDS become both grabbed 13 of each other. But the biggest embarrassment for the Congress was to make alliance with that party who defeated their CM with a record of 25000+ votes. Only plus point Is the 8-11=7 independent seats that they gained. The only party who was gainer in all the numbers but still short of majority. They gained 48 from INC, 7 from JDS and a total of 9 from the Independents. 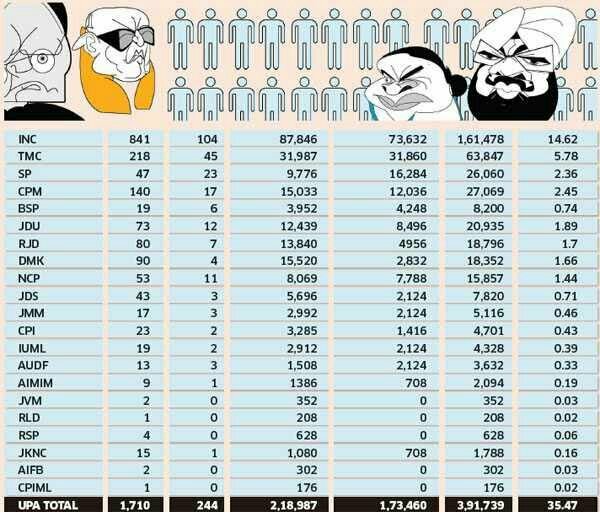 So, from the above Statistical analysis its clear how the three parties performed in the Karnataka elections. 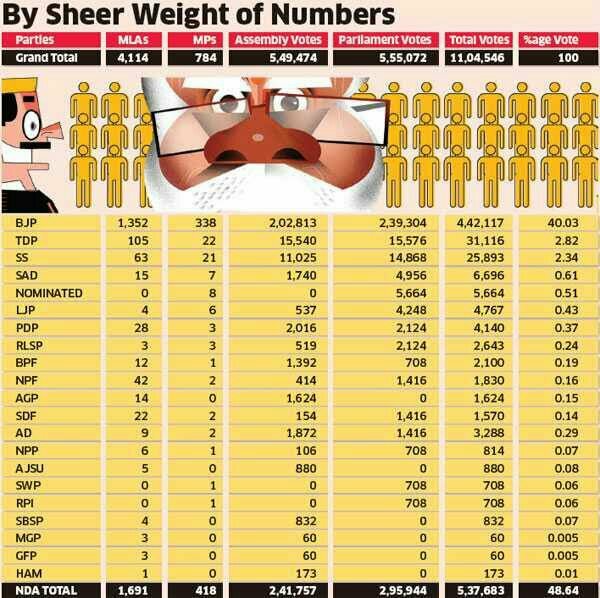 BJP being the single largest party was short of the majority by just 7. The Numbers clearly shows that the Mandate was against the present government and in favor of the BJP. And the INC and JDS should understand the fact the if they would have grouped before elections they would have wiped the elections. Finally, a Fractured Mandate. Hope So the government would run Successfully and effect fully just for the interest of the people. One of the latest and the hottest topic in politics. Usually any controversy revolves around a person or an issue. But this time it’s very interesting because this time it’s neither person nor an issue but a simple ‘Pakoda‘. It all started with an interview when the PM Narendra Modi was asked to reply on the unemployment issue in India. The question was quite obvious and clear but the way the PM responded was quite clear but it fumed the opposition and the critics. And now all the statements and debates are surrounded just by the innocent and famous fast-food of India the ‘Pakoda‘. Now let’s see what the PM’s approach would be and how the critics waved it. Which simply means that why to consider only office work as employment! And why not to add The concepts of Start-ups and Small scale businesses under Employment! As compared with jobs Start-ups have greater earning capacity and endless growing scale. If a person starts a small scale business he would not only support his own family but also give employment to 5-10 youths, which further decreases the unemployment numbers. Just a single youths decision can affect the life of 10 families then why can’t the startups be given more focus and priority in our Nation also. By boosting Startups and motivating the youths for business will solve the problem of Unemployment within couple of years. This was the clear and simple attitude of the PM when he answered to the unemployment question with the example of the ‘Pakodawala‘. But as its Politics and that also Indian Politics. Which interpreted the statement as the PM wants the unemployed youths to sell Pakodas on not getting a job. Like an excuse to answer to the question of unemployment as asked by the interviewer. This misinterpretation was not simple. It boosted like a big wave. The opposition tried to create a big controversy. Many jokes trolled the netisans. Some graduates in Bangaluru protested against the PM’s rally but demonstrating a scene of frying Pakodas wearing their convocation uniform. Now this was a very depressing and worrying movement not only for the BJP and PM but also for the youths of the nation. Sorry to say but the opposition demotivated the Aspirations of the youths in the Country. Also they Lowered the Self-esteem of the sincere and honest workers of this Country who don’t beg but earn honestly and with self-respect, who are non other than the ‘Pakodawalas‘.! Frankly speaking the statement of an former minister who compared the Pakodawalas with beggar was demotivating and very cruel. Employment in India is like, score good have a degree and secure a safe and relaxing job. But we forget that only government jobs can’t fulfill the need of employment in this country. They need to be dependent on the private sector as well. And private sector’s contribution is much more as compared to the Government Sector. We also forget the simple thing that if we want jobs there must be someone who must think of giving and creating jobs also. That means for the generation of jobs we require some one to choose Entrepreneurship as his career. Then and then only he would be able to give employment to number of people. So before seeking a job one must have to respect the Entrepreneurs and his Enterprise, though as Big as The Reliance Industries it might be and as small as a Pakoda shop it might be. I was more surprised with the youths who completed the degree and are demonstrating in front of the rally. It feels like the universities have just created engineers and forgot to make them humans also. Last week I watched an interview on the Budget session on News channel held in the Gokhale College Pune. Where I listened to the answer of an economists on unemployment asked by the Student. Which simply means that the Indian Education system has failed to make a student a better person and skilled professional in his field. It has just succeeded in manufacturing graduates. Here I would seriously infer that our education system needs to be revised and should focus more on the quality of the student rather than his marks. If a graduate is skilled enough why would any company reject him. And why would a skilled graduate wait for a job when he is confident on his skills and choose Entrepreneurship as his career. This attitude is what needed when dealing with this issue of unemployment. And that’s why the PM focused more on Entrepreneurship than on Jobs. Pakodawalas Perspective: It would have been a great embarrassment for the Pakodawalas when then profession was made a joke throughout the whole country by the mere critics. This not only hurted their self-esteem but also questioned whether their profession was as low as disrespecting and comparing with begging. It was a bad game by the Critics. The PM was clear in his view on identifying their profession as a source of employment. This comment of PM would have given them some sense of pride and respect which the others made it a joke. Pakoda Politics: Now let’s see how this Politics will change the scenario of the day-to-day Indian Politics. When the wave was on its high node it created a feeling of unacceptance among the unemployed youths which further reduces the image of PM in the heart of those who were seeking jobs. But the ones who know that job is not the only answer to unemployment there would have been neutral reaction. But the major effect would be seen on the side of the Pakodawalas. The Opposition was on the forefront in this defaming wave. This would affect their image alot. Simply calculating there are minimum 1000 Pakodawalas in each city, with 5-10 associated with the business and 3-5 people in each of their family. At minimum 20000-50000 people related to this profession of fast-food. And the opposition has lost this crucial vote bank by joking on Pakodas. Here I would like to note that the votes would be irrespective of the caste and religion of the Pakodawalas. And the constant defamation of a person by his profession by the opposition also dented their fame in the public. First it was the Chaiwalas and now the Pakodawalas. This even change the caste equations in present politics which will discuss further. Today’s Caste Equations: We must understand this thing that caste is not just by birth but also by the choice of his earning. And every person has an intimate relationship with his work. Like earlier if we see the caste formation then it was based on one’s those days profession. But today with the time the professions have changed but the attachment with the work is the same. Similarly running a fastfood shop is also a caste in present day. So if anyone who disrespects the profession or work is an direct attack to his dignity. And these new professions have even cutted the past caste differences when any danger comes to their profession. That’s why we may see number of morchas for the rights of teachers, municipal servants, government servants, engineers, doctors. And these are the new caste equations which the politicians must understand. It’s very interesting to note that the BJP had understood this very early and had used it very well in the 2014 elections with the concept ‘Chai Pe Charcha’. This created a bond of recognition and oneness among the tea-sellers. And now the new campaign ‘Pakode pe Charcha’. Message to the Youths : I sincere feel that Unemployment is one of the recent and emerging issues in our Country. But dont blame and rely on politicians. Government will come and go. But we need to find our own source of earning. Because it’s our issue. And seek for different modes of employment. New courses, new skills and competition is everywhere. I also agree that everyone cannot have a business but among a group one who is wealthy must take the initiative for a business. Or person with the ability, skill and idea should be helped and encouraged for doing business. And the one who takes. Initiative must take the responsibility of minimum 5-10 of his fellow friends to give them employment. Only this can help us for getting out of this problem. As we have seen that a couple of weeks ago PM Narendra Modi along with The Japanese PM Shinzo Abe inaugurated the most prestigious project of Mumbai-Ahmedabad Bullet Train in India. Now India is developing and is running on the track of Prosperity with the bullet speed. But how many of us know that when will the bullet train be on track for us? Or how many of us know about how costly is this project? Are these trains really affordable for India? If not then what’s the Importance of Bullet Train in India from the Global perspective? In this special article we will be covering all important facts along with its significance from a common man’s perspective. In Gujarat: Vapi, Bilimora, Surat, Bharich, Vadodara, Anand, Ahmedabad, Sabarmati. High Speed Rail Training Institutes will train about 4000 Technical Staff of the Bullet Train Project. Japan Govt offered training of IR Officials in Japan reserving fully funded seats for The MS course in Universities of Japan for them. Future Plans : Extend The Corridors to Pune and Nashik. Biggest Advantage : It cuts the present 7-8 hours of travel to 2 hours. There is no doubt that there will be a revolution in the field of Railways due to this Project. Jobs will increase, trade between Maharashtra and Gujarat will increase, but only when this project will get completed as soon as possible and the trains are on track with passengers. To clear some doubts about its costing is that our country is going to invest only 22000 Cr rupees for the project which is going to be contributed by the two states. For this project we have given a loan of 88000 Cr by JICA with 50 years of refund period and that only with 0.01%. Therefore this project is a challenge to the Indian Economy. It is said that both the states are going to be benefited from this project but my assumptions differ a bit. To be loud and clear Gujarat will be the most profitable in the Success of this project. Because we can see that there are only 4 stops in Maharashtra while 8 stops in Gujarat. So more people in Gujarat will get benefitted. Also it’s a the time to check what amount traffic is there on this route and are those traffic really going to afford this service at the prescribed cost. 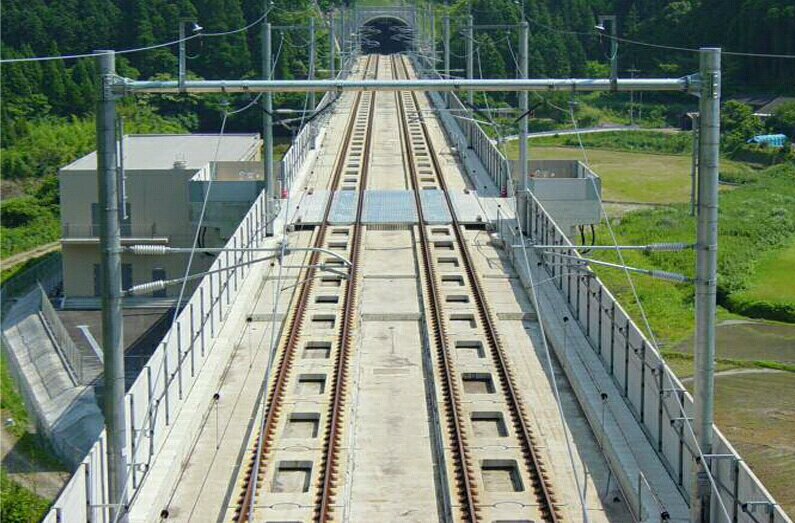 Let’s consider that the Project is completed and the trains are on track but who are the passengers actually going to travel through this trains? Frankly speaking there will be more people coming to Mumbai as compared to the people going to Gujarat. Most importantly there is an emerging option to the Economic Capital in its own Neighborhood. From a Common man’s perspective it’s not for him directly but indirectly it’s for him in the face of increasing business. Because common man will be benefited only when his boss has some business to do. 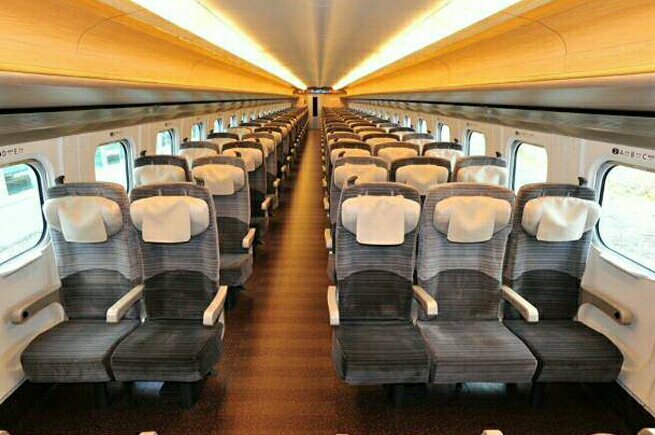 And if this Bullet Train increases the business then surely the common man will indirectly be benefited. This project will sure bring a reform in the Trade, Railways and Infrastructure of our Nation. This will not only boost the nation’s economy but also in the daily life of our people. Posted on September 28, 2017 January 19, 2018 Categories Political, Technology7 Comments on New India with Bullet Speed…! You all might be imagining what about the whole incidence is.? And why have I focussed too much on the clothes.? The incidence marks the day of the felicitation program of the Campus placed candidates from our college. It was an event organized by the students of the college to share the experience of the campus placement. I found it interesting and decided to speak that day and enrolled for the same. And so I went with my full preparation for the program. Now u might be wondering about the formal clothes that I highlighted at the beginning. Actually they are the main hero’s of today’s blog. But to become the Hero it took a long journey. Now let’s see what it actually was.!! They were the days of June when I had finished my final exams and came home for vacations. We hardly have vacations of 15 days. On the 10th day I was all planning to move to Pune earlier as this time the Campus was going to be held soon. This time I studied well so that I could already sit for the companies who criteria is about 55%. And after exams I was quite sure that m going to cross 55+. So started preparing for the Campus a bit early. For campus I need to buy a pair of formal dress because if tomorrow I had to face any interview I hardly had any formals to wear. So I decided to get a pair of college formals to be stitched. As I told this to my father about the placement he was very happy and overwhelmed. With this excitement he said, “Let’s not waste time, we must purchase them today itself”. As a father he was very happy about my campus. As it was my first interview he was excited too. I was also feeling happy. My father is a big hearted man. If u ask for one, he’ll give u extra. That day the same happened. In the evening me, my father, mother, siblings set out for shopping. I was annoyed about where was my father taking us for the shopping. We stopped near a showroom of Peter England in the New Cloth Market. I was wondering whether he was taking us to the same shop. And yes he did. We entered the shop. I couldn’t utter a word because I was not getting that is he serious about what’s happening. Then he asked to show some formal pants. The shopkeeper showed us some very dark pieces of formals. My father told me have a look at them and choose which ever u like. As soon as I heard I was overjoyed and I was fully engrossed in it. I saw some 8-10 pieces and finally choosed a cream color one. Then we shopped for some formal shirts. Actually while shopping I don’t think too much but here I didn’t found any. In a corner I found a very fresh and shiny blue shirt. It took no tym for me to finalize it. In this way the costly shopping was over. But wait there’s something more. 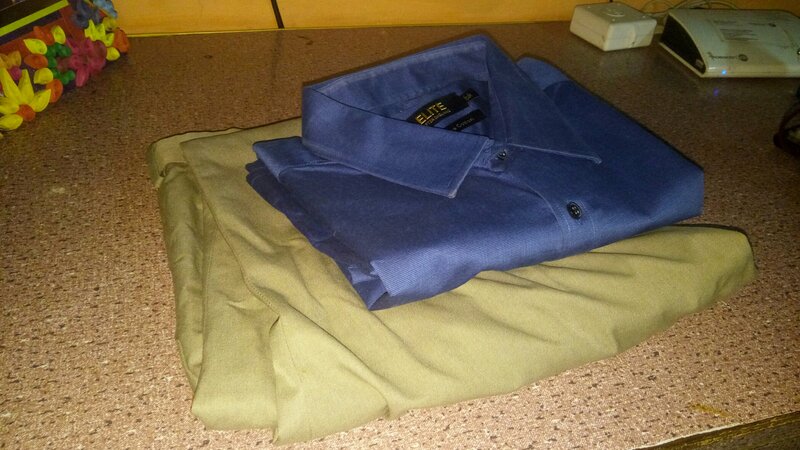 My sister and mother were searching from a long tym and found a very nice light navy blue shirt. I tried and finally we took that also. Bill is never an issue when you are shopping with your parents. Evening when we came back I sorted the clothes and kept them in bag. But just for my curiosity I checked the price tags and I was shocked.!!! Only the pant’s cost was above 2k!!! And the total summed upto 5k. It was unbelievable. I meant I know our parents love us and give their heart out for their children but my heart was not ready to accept it. Not because it’s price is too big but the expectations behind them were more bigger than I myself had for me. Frankly speaking I was a bit embarrassed because I was a yeardown student, and this time I had hardly being able to sit for the Campus placement. I just wanted a pair of college formals that we wear regularly in college. I was nervous because I found it difficult to accept that moment!!! But I took no action that day!!! Then I went to Pune and when the Campus dates were declared I was happy. I logged in to the portal and found that the only company that I could apply for was the Accenture!!! This was less a shock but more a challenge!!! And that day I took a very important decision that proved a motivation throughout the Campus Placement!!! That day I decided that untill I get placed in the Campus Placement I will not wear these formals!!! 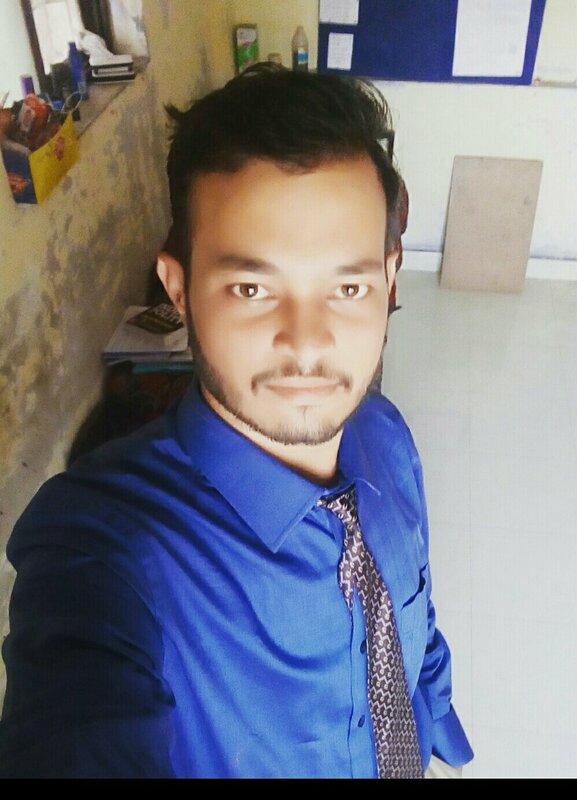 The day I’ll wear formals will be the day after my Placement and this formals will then be My First Earning…! This commitment I took when I realized the importance of the new target that I set up before me. The day after I took this commitment I started working for my target. I did all the research and discussions required to reach my target. Being sincere with my commitment I wrapped the clothes nicely and kept them in the bag safely. And my journey began. Days came and went, they are ment to be. I did aptitude study, reasoning I did. Then I did a lot of reading. Had a number of discussions as GD is also one of the major part of the Campus Placement. There were many such incidence happened when i had no good clothes to wear except the formals but being honest with my commitment I never even touched them. I tell u many times it happened that I had no washed clothes to wear on precious moments but still i stood on my words, never sacrificed them. I would like to share an incident when it was our department Fresher’s Party. Being one of the organizer I was engaged in the preparations even till the last moment. The party was to begun in half and hour, I came running to my room, got freshed and searched for clothes and I was shocked to see no clothes washed and ironed. Though I was careless still i don’t blame myself because it is my nature of work. When I work I put myself fully into it. Due to which I even forgot to prepare the party. Only thing that I had to wear was the pair of college dress code. 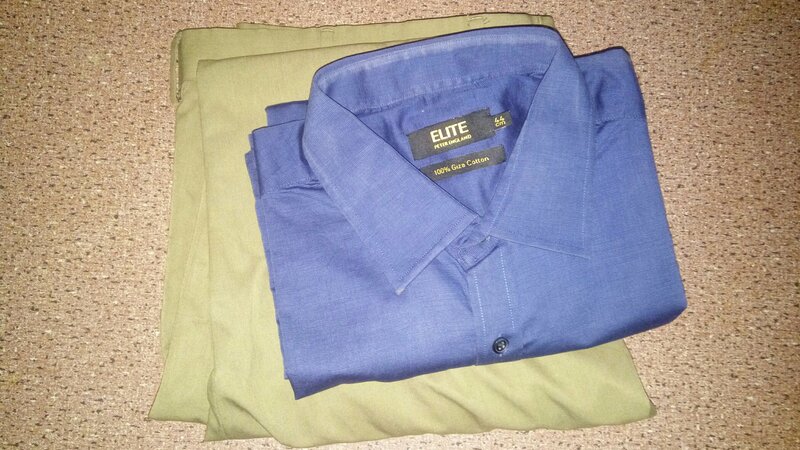 It was a pair of sky blue shirt with navy blue pant. The shirt was dirty in the arms and the pant had white patches of dried sweat. I felt embarrassing to wear them. Suddenly my eyes went on the bag. I looked it once. My heart said it’s the best one for the moment. Then I said no, I’ll not sacrifice them for even one event. Then I took my wet towel and slightly moved it from my pants. After 2-3 moves I found the stains removed. Then I wore my blazer on the shirt that hided the arms nicely. After I got ready I found myself okk with my look and to tell u after the party when I was on my room lying on the bed i found myself laughing about the incident. Because when I was in a party I got a number of compliments. And the most surprising was that of the girls. As they were annoyed of the reality I was smiling from inside. In this way many such incidences came but I didn’t compromised them with my commitment. Slowly days were moving and the recruitment day was coming closer. Finally the day arose for the first round. Me and my friend Shubham left for the college early in the morning. I remember that they were the days of Ganesh Chaturthi. Me and my friend went to the Dagdusheth Halwai Temple. We took the blessings and left for the college. Before the aptitude one of my friend Pooja helped us with the revision of aptitude topics. This boosted our confidence. Then we entered the college and gave the aptitude test. After test we went to Alandi. The results were to be announced in the evening and I got a mail for the next round. I was very happy. Next day I prepared fully for the interview. This day too my friend Pooja helped me to prepare for the interview. That day was a very hectic day. Because though we were called at 8 am in the morning for the interview but there were total 700 students for the interview and finally our group got its turn at evening 4pm. I was frustrated with the management system and that reflected in the interview with a low start. But as am confident on my communication I coped up fast. I saw a glimpse of satisfaction on the face of the interviewers though I made a few mistakes. I came smiling out of the panel. After 15 days the results were declared. I was sitting in the hall. And the announcement started. It took a long time. I was holding myself towards my heart and the most awaited moment came when the anchor said, ” Samruddha Bhirad…”. I felt a great relief and took a deep breathe. The journey was completed. I have fulfilled my commitment. I first shared this news with a text message to my parents and friends. It was a great feeling of relaxing and happiness. My heart was full of gratitude. That moment of joy filled my heart so much that I hardly remembered about the formals. Days passes and the offer letter was in my hand. And a day came when the college students decided to share their experience of placements with the new aspirants. That day I thought at once that I share my thoughts and guide them with whatever I can. And I enrolled for it. Till the morning of the program there was not even a single thought about the formals. As usual I woke up, got ready and the moment I searched for the dress I found none and then formals struck my mind. And the whole story stood before me as film trailer. My heart felt with deep satisfaction. That day I had no one to share my great satisfaction and happiness regarding the fulfillment of my commitment. But that realization also gave me a reason to share my story with u all. That day and this day are the only time in my life when I have share my experience of the fulfillment of my commitment. Truly these pair of formals proved to my first ever earning. That day I took that bag out and wore the formals for the first time. That day I felt proud to wear them because it was my first earning!!! What I learned :- Sometimes we need to sacrifice a little for a bigger one.!!! Posted on July 14, 2017 January 19, 2018 Categories Personal11 Comments on My First Earning!! And yes all the suspense is clear. 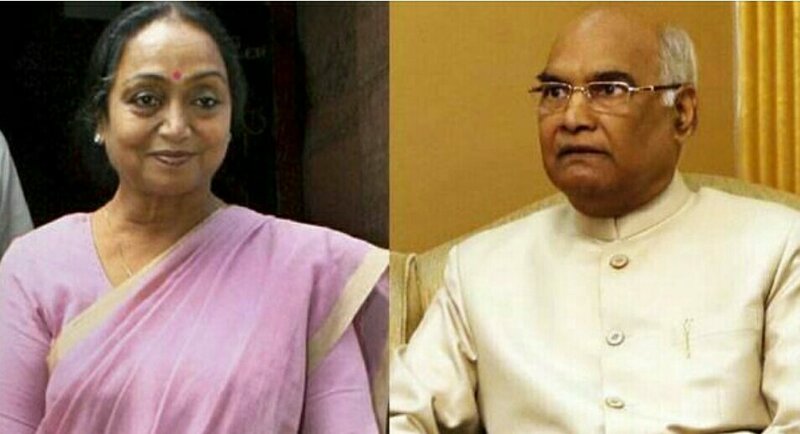 The most awaited candidates for the prestigious battle of Indian President are here with Sir Ram Nath Kovind being the NDA led candidate and Madam Meira Kumar being the UPA led Opposition candidate. Now let’s see how the fight would all be like. Let us first check the background of the candidates. He was the present Governor of Bihar. He hails from the state of Uttar Pradesh and from dalit community called Koni Community. 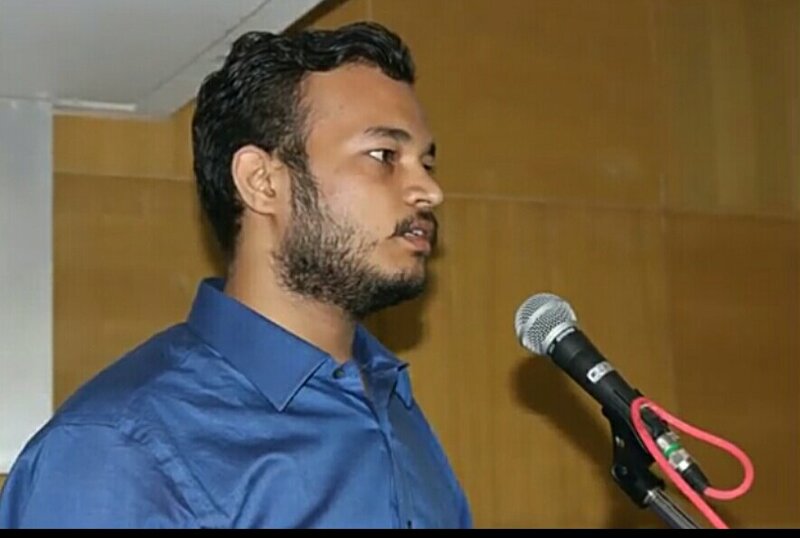 He got selected in Civil Services in his 3rd attempt but refused to join it as he did not got IAS. He has a great experience of advocating for about 16 years. He was Rajyasabha member about 12 years and never won in Loksabha. He worked on various committees in the Parliament. She is doctorate from Banasthali Vidyapith. She served as IFS and worked in many countries. She was elected to Loksabha 5 times. In the last Loksabha she was the Speaker of the House. She was also the Minister in the UPA led Government. Now let us see how the elections are held. The last date for filling the nominations are 28th of this month while on next 28th we get our New President. The election procedure is hard to understand as it’s unique of its kind. The President is elected through the electorial college. All the MP’s of both the Colleges and all the MLA’s of all State Assemblies vote in the Election. 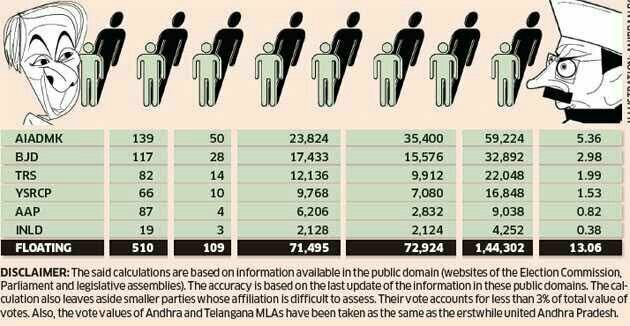 Here the value of each MP is 708, but varies according to the state for the MLA. For example, the highest MLA vote value is 208 of the state of Uttar Pradesh, whereas the lowest is of the state of Sikkim i.e, 7. From the above analysis we can see that NDA has 48.64% of votes with 40% of its own as BJP and is only 2% short of winning its candidate. Whereas the joint alliance of opposition including 17 parties is about 35%. It’s a big tough fight for Kumar rather than Kovind. For Kovind to win the NDA hardly needs a support of any one of the opposition party. Whereas Kumar requires a complete support of the opposition along with some of the Allies of the NDA. But both the possibilities for the Kumar are more than tough. Keeping the opposition in a single thread is not so easy. And to break the Allies of the NDA needs a strong reason or a very tough candidate. 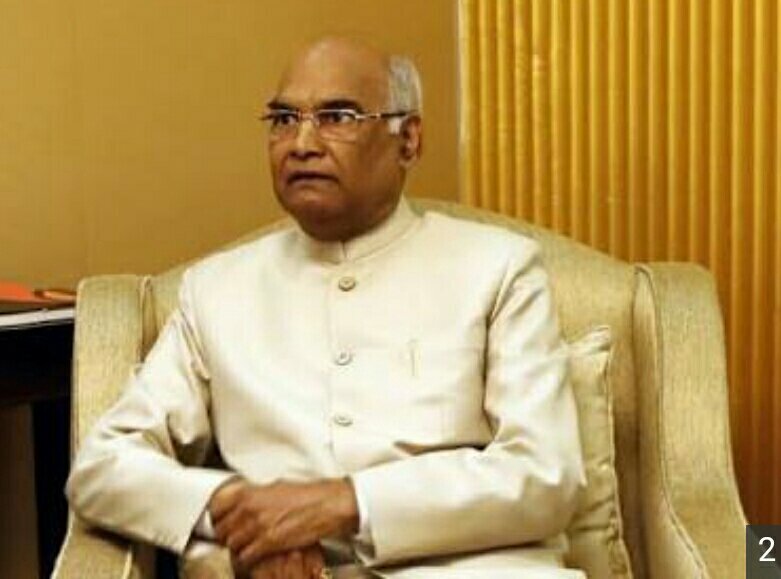 Amit Shah and Narendra Modi played a very intelligent move by playing Kovind as the Dalit card. Making the opponent to play according to our will is a very smart move. And the opposition did the same as expected. They also placed a strong Dalit candidate i.e, Meira Kumar. Opposition was in constant search for a tough candidate. Many names emerged but one name I feel could have been much tougher than Meira. 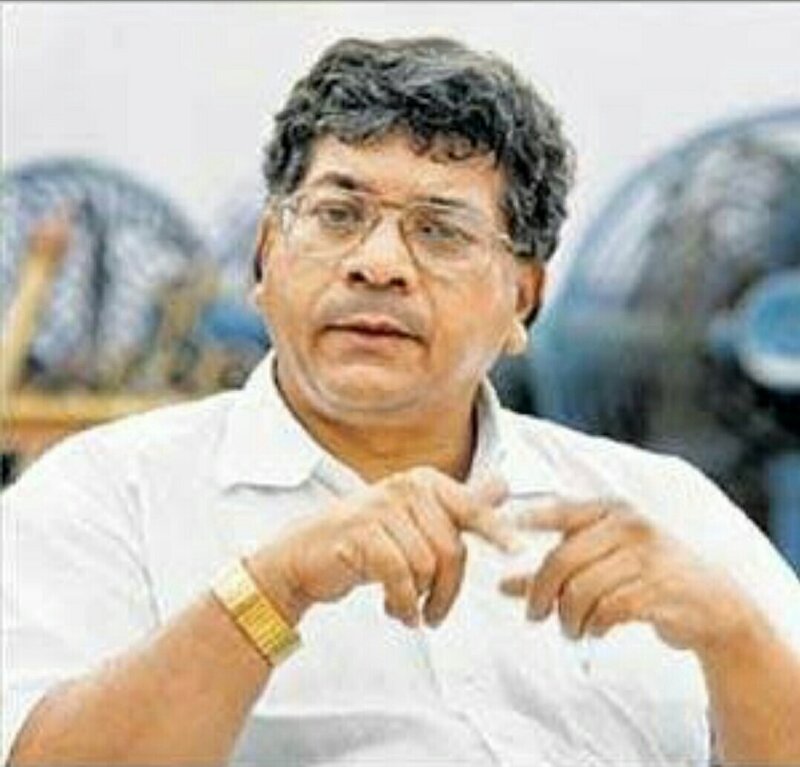 He is non other than the grandson of the Architecture of our Constitution Dr.B R Ambedkar, he is Prakash Ambedkar. Yes it might be shocking for u all that why am I saying such. Frankly speaking Meira Kumar is more deserving as compared to Prakash Ambedkar. But the reason why I think Prakash Ambedkar would have been a better option is his brand himself. Prakash Ambedkar belongs to the Dalit Community as well as he is the Grandson of Dr. B R Ambedkar. He is well educated, has represented Loksabha from Akola constituency as well. But he fails to create a strong record in his career. But still I think he could have been more effective as compared to Kumar. As we can see that after the announcement of Kovind as the candidate, the Political Parties like JDU, AIADMK, BJD, TRS, TDP, BSP has already announced their support to Kovind. From the statistics we can see that 11% among 13% of votes have now added with the 48% of the NDA votes which make their votes share to 59% + 2% of JDU, that equals to 61%. And regardless of the opposition candidate, KOVIND would be winning the Election with an enough majority. But then why Meira Kumar? If there needs to be a tough candidate then why not Prakash Ambedkar. Because on this basis the opposition would have been together. Also the it was very tough for other parties to avoid a candidate who is a grandson of Dr. B R Ambedkar aiming at Dalit Politics. Also the parties like JDU, SHIVSENA, BJD, AIADMK TRS would have been urged to support the candidate. Also the Allies of the NDA would have been urge for the support. Though not all but at least a few would have support his candidature. And this would have given a tough fight to Kumar. 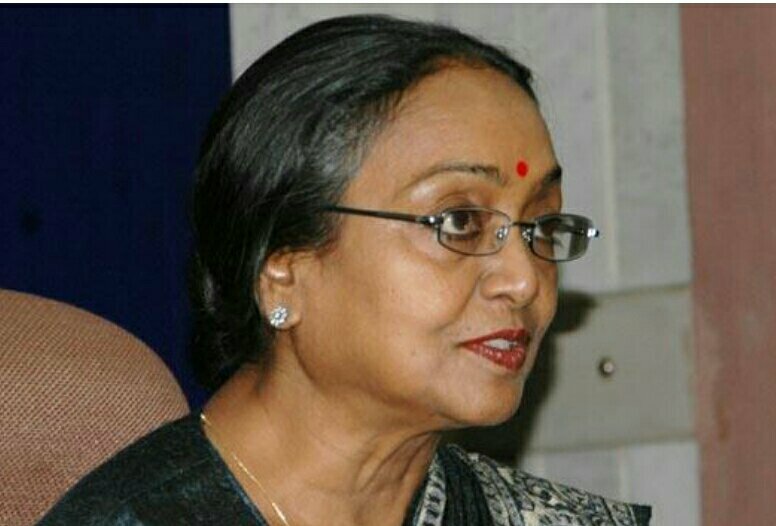 Nitish Kumar who is trying to increase closeness with the NDA and improve his image within Dalits could efford to oppose Ambedkar’s candidate as boldly as he is opposing Meira Kumar who belong front the same state. Prakash Ambedkar was strongly supported by the Lefts but finally got rejected by the Congress dew their internal Politics. Now the scene is clear and here a very straight forward fight is going to take place between KUMAR and KOVIND. Where Kovind is all set to win the Election with 61-65% votes share and Kumar around 35% votes share. President is one of the most Prestigious post in our Country. Hope for the best one to hold it!!! 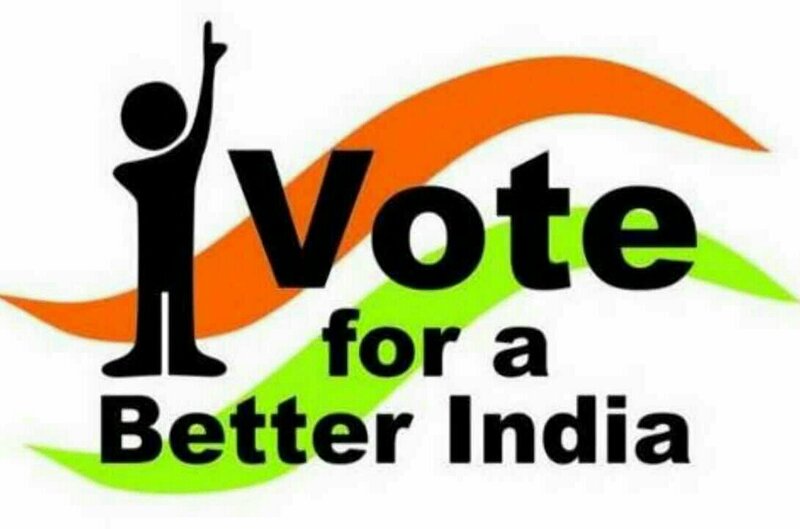 Election is one of the trending topics in the talks of the Indian people. India is a democratic nation and all the important power lies in the hands of the people. It has a vast structure of government. Basically there are two main government. First is the Central Government and second is the State Government. As the structure along with the posts are rigid and its Leaders change regularly and through a process called Elections. It’s process of selecting the majority Leader among the aspirants for the post. In centre there is Loksabha and Rajyasabha whose members are MP’s or Members of Parliament. In Loksabha they are directly elected through the people while in Rajyasabha they are elected from the State Assemblies. In State there is Vidhan Sabha and it’s members are MLA’s called the Members of the Legislative Assembly. The are elected directly from the State people. As we can see that in the about example the government of India is hold up by the Leaders of Majority. For being a part of the government the Leader needs to be elected from the people in the Nation. And this all comes from the wide process of ELECTIONS. But as we can see from the wide structure of Legislature in India we can infer that there are various Autonomous bodies held for Governing the administration of the specified area. For example we can see that there is Parliament for governor Central or country related issues. There is Vidhansabha for Governing the State. Jilha Parishads for Districts. Municipal Corporations, Councils, GramPanchayats and Panchayat Samitis,etc. This governing body of the Autonomous bodies are decided through elections. Each body has its fix Elections Procedure. These are held regularly after a fixed tenure. 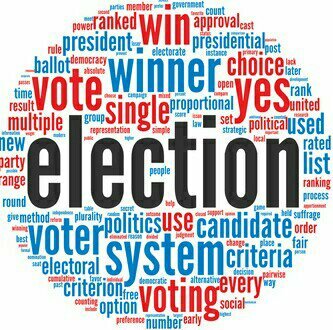 Thus Election helps in renewing the governing body regularly and strengthening the Democracy. Though the structure is very organized and well defined there is still a very important hole in the System. This important point is of SUCCESSIVE ELECTIONS which detains the Political Stability in India. For the completion of the total procedure of the elections it takes about months. Till the results all the Development Works are holded on. Is Centre is constructing any road and there are State elections then still the work needs to be pending which further delays the execution of the work. 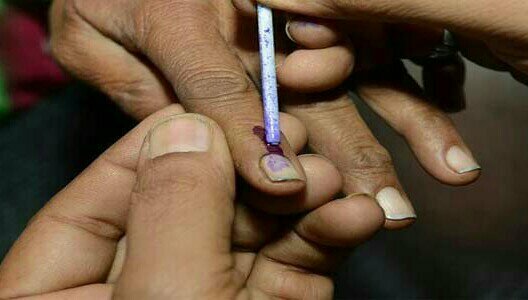 Every election is carried out with complete planning by the Election Commission. Cost for separate election is more. Thus this process increases the cost of election. People for the process, arms and security is on duty during each election. Leaders need to campaign whenever there are elections. There is no space for sustainable development work. Spending on elections is more on simultaneous elections from the side of political parties. There are two big solutions to the above problem. Considering any state it is governed for 5 years by the state government. 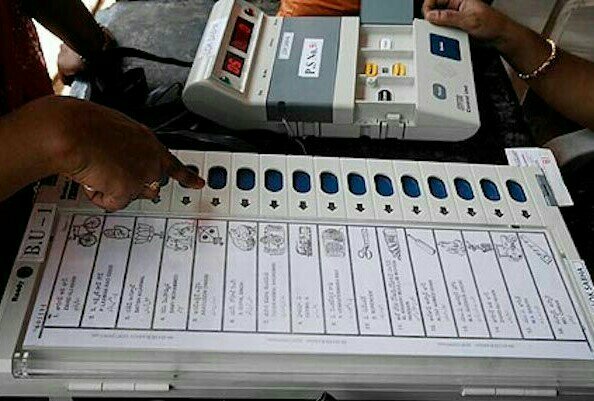 Along with state elections there are also Loksabha elections, elections of Municipal Corporation, Councils, Zilla Parishads,etc. They have 5 years of tenure only but they start at different date. So this keeps the State commission busy within the 5 years by carrying out different election campaigns. Any election process lasts for about 2-3 months or more. During this period it’s necessary for the government to halt all the Development Works. Son if there are 3-4 such campaigns within the tenure then there are more hurdles in the development which weakens the process of development. To avoid this a new concept of One Time Election was being introduced and even promoted by our PM Narendra Modi. All the different elections to be held once. Which will there for smoothen the path of development for a continuous period of 5 years. One time expenditure on elections. Continuous development for 5 years. Political Parties need not to spend much for SUCCESSIVE elections. Large amount of force will be needed to focus at the time of elections. Hard to control the riots during elections. Deserving candidate once lost will have to wait for next term for 5 years. In the above method there an important consequence that is of the continuous powerhold for 5 years. This may be harmful of the economy too. The Leaders may come and go but the Leadership should always be sustainable and updated. Also we can take the example of our college exams also. We can find that the students with yearly pattern are more relaxed as compared to the one with the Semester Pattern. Yearly exams have less tension and mostly the students don’t take it seriously in their early days. Even some do studies just 1-2 months before the final exams. This is not the case with the students studying in the Semester Pattern. These have short period to accomplish a big goal with number of activities. And we find them busy throughout the semester. And it’s always better to eat in two half’s rather than eating a bigger one. So relating this with the Election we can say that there should be elections after every 2.5years. I introduce this concept firstly because I feel concerned about some important topics related to the concept of elections. What I think is that the state and the center should have elections with a distance of 2.5 years. Suppose the Central elections are conducted in Jan 2014 then the state elections should have been conducted in July 2016,i.e, after 2.5 years. Again the Central elections will be held in Jan 2019 and the state in May 2021. These elections have a gap of exact 2.5years. The cost of elections will be within a particular limit. Armforces will be handled and utilized efficiently and effectively. 2.5 years are sufficient to work continually without any break for the Government to implement effective plans. Elections after 2.5 years will be the litmus test for the respective Governments. The performance of the Center will be judged from the work in these semesters. Suppose for eg. There is BJP in Power in Center from Jan 2014 to Jan 2019 and the Maharashtra is ruling with the Congress and will face the s elections in July 2016. And if there is change is mandate from CONGRESS to BJP. Then there we can see the following two combinations working together. Sem1: Center BJP with State Congress. Sem2: Center BJP with State BJP. This will allow the Center to experience the coordination with the state with different powers. This Center State Relationships along with their individual performance will help the voters to decide comparatively to give it’s next mandate. Leaders will get sufficient time to work as well as the Semester elections will prove a litmus test for their party. Cons: Frankly speaking I have focussed more on the positive side of the topic so might be am unable to look at its other side. So I request u to please go through it. Think about it, read it and please give ur genuine suggestions regarding the cons of Semester Pattern in Elections. Also I would like to request u to please share your views, comments and suggestions regarding both the solutions. Many times I hear that the system is bad. I don’t think that way. If we think it’s not good let’s make it how it should be or How its supposed to be!!! And it’s a simple step towards a change. This is about an year ago. When everything was going good, college life, personal life and was walking confidently towards my goal. I was in my third year BE and the only goal I put forward was to score high, get my aggregate above 55%, and crack anyone of the Company in the upcoming Campus, next year. I was working slowly and steadily towards my aim. I live in a small town of Alandi, as it’s not my native place, I came here for my graduation. Alandi is a Holy place of Sant Dnyaneshwar. It is called as the WORLD PEACE CENTRE. There is a Temple of Sant Dnyaneshwar Maharaj who had been a very renounced Sant in the soils of Maharashtra. 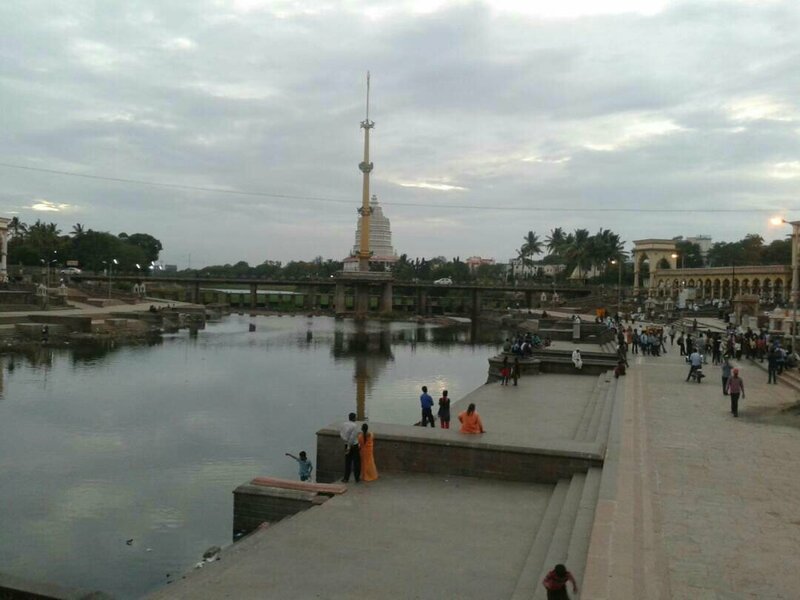 Alandi is blessed with the holy feet of the Sant and also with the flow of the Holy river Indrayani. 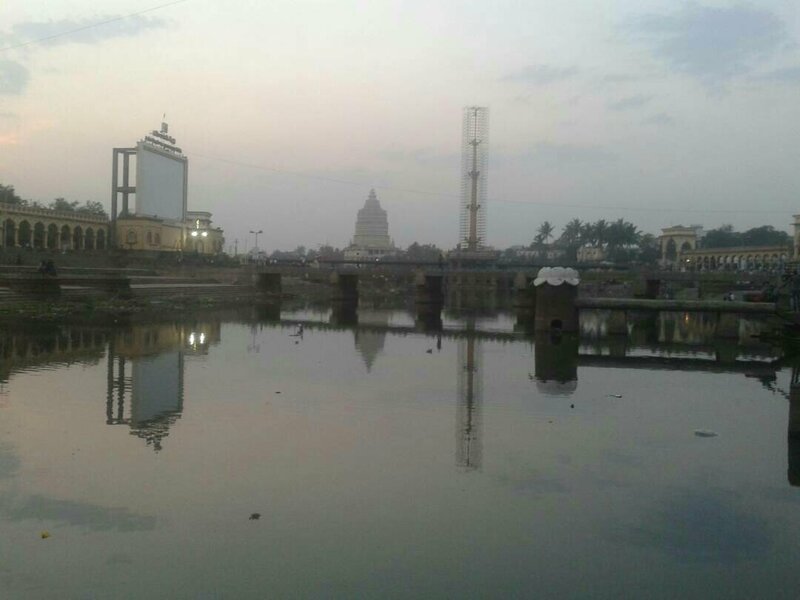 On the banks of the River there is the Temple and hence the entire city has created it’s name as one of the well known Pilgrims in India. On the banks of river Indrayani, is built the beautiful ghat where students of our college come to spend some time. The Indrayani Ghat is very peaceful, it is built on both the sides of the river, there are stairs and sliding path to the river water. That day me and my friends decided to go to the Ghat. Me and friends set off. It was the exam time and we were bored studying for hours. We packed our bags and went to the Ghat from the college back gate. We had a great time. There we did nothing but relaxed and talking with each other and cracking jokes. This is all what a happy life is when you have your beloveds with you, a pleasant place to spend some quality time with.! 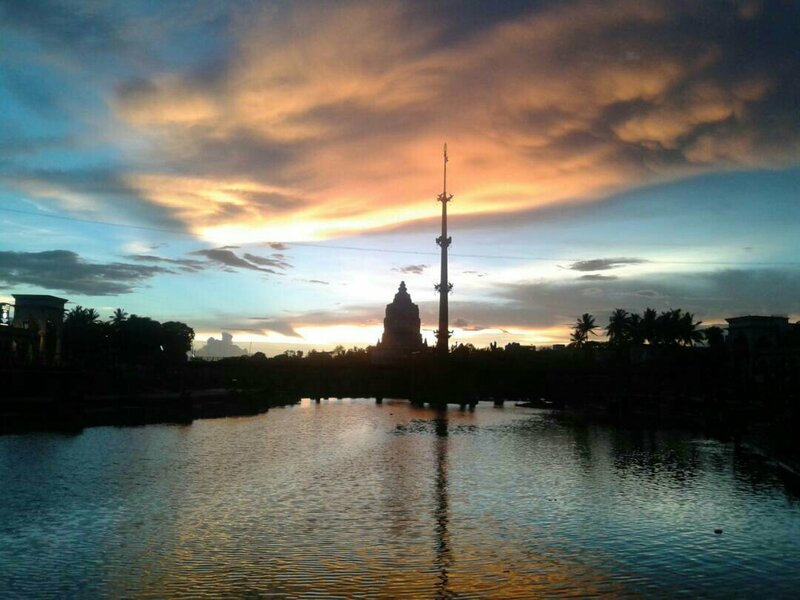 The cool blowing winds, the huge Ghat, the peace of spirituality, the flow of river and the charming sunset. This filled my heart with happiness and prosperity. Felt a great relief and rejoiced. Then we left for the hostel. Coming from the Ghat we often cross the back gates of our college and in a corner of our back gates there is a nursery. I usually notice it many times but today I gave some special attention. And then I decided to have a look to the nursery. As soon as we entered we were amazed with the fragment smell of rose. There were a lots of variety of flowers. Though Parijat is my favourite, I love the presence of flowers and the charming smell of wet soil. I didn’t planned but I am a great admirer of Holy Basil, Tulsi. And I took a small sapling of Tulsi. 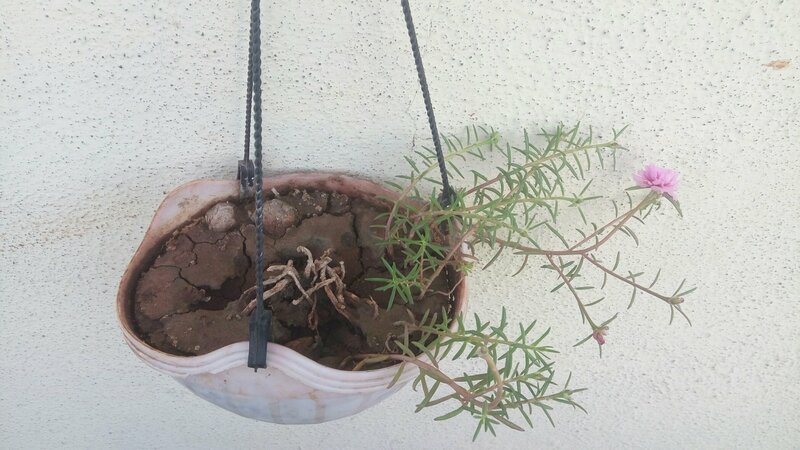 Sapling is not enough then I took a brown color pot to place it, grow it. When I was leaving the place suddenly i found a handing pot that amazed me alot. Instantly I suggested to purchase it. But what to do with the empty pot!!? And then the Gardner suggested me to take this creeper. It was a beautiful plant with spreaded green stems and colourful flowers of blue, magenta, pink, violets,etc. I loved it and I brought it. In my room I have a window above the study table. That was the only place where I could keep my Tulsi plant with half window open. And to keep the other one I purchased a hanging one and hung it on the windows of the corridors. Dayz passed and the plants were growing. I used to water them full daily in the morning. Tulsi is very pure. When I was small my mother used to place some leaves of Tulsi under my tongue before going for exams. She told me not to eat them until u finish the paper. Once finished eat them. I never asked reason because I liked it’s taste, freshness and purity. 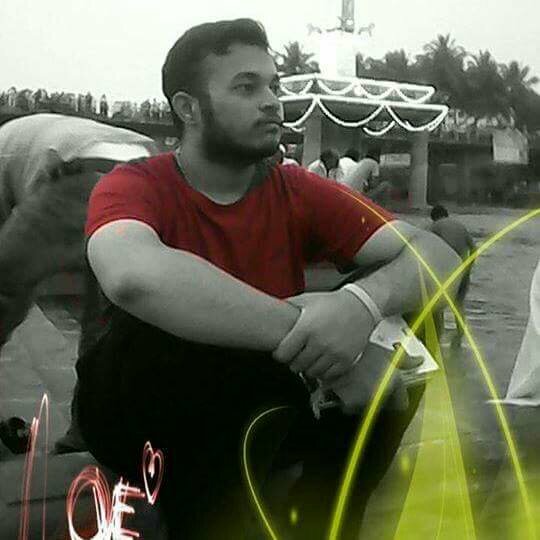 Weeks after one of my friend Pavan came to Alandi. He saw the plant, liked it and asked for it. I gave him without uttering a single word. Many a times in life, time comes when u have to make choice while sharing things and many time we are so much attached to things, people and conditions that we can’t bear even to think of sacrifice a little about it. But then one day I found the stems leaving it’s freshness and the plant was covered with a white sticky larva. It covered the stems and roots if the plant. 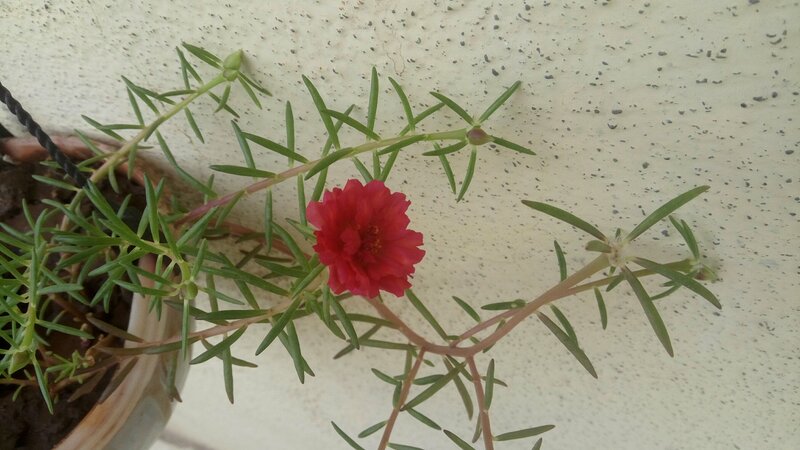 The plant almost stop growing the flowers stopped blooming. The sapping was caught by some infection which started degrading the plant. I was getting nervous as I was unable to help from suffering. Then I decided to was the stems with water and remove the sticky larva. I did it once and found that it’s too sticky. I needed to wash my hands twice after cleaning. But again after some days the condition remained the same. The plant was again covered with the sticky larva. I again washed it. Again it used to come and used to wash. After some dayz I got fedup of these tedious and donkey work. Even I refused to give a watch to the plant. Some times I even ignored it also. But couldn’t do that for longer. One undone sunday I decided to cut the stems of the plant so that the root of the problem will be uprooted forever. I took the plant and a gillete blade. Now I started cutting the stems from the base leaving a small part. Slowly all the stems were uprooted and the big full plant was turned into empty and unpleasant one. I was happy that I cured the disease. But suddenly I realize that though I cured the disease but I lost the plant. I was stunned with the scene. I never expected this anymore. I was upset. 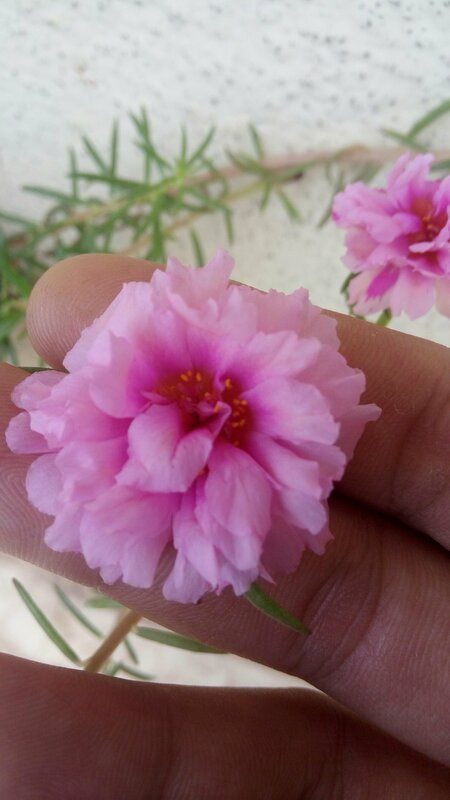 Though it was just a plant but my feeling and emotions for the small plant was beyond that. I felt the freshness when the flowers were blooming in the spring, I felt the pain when the larva degraded the plant. When the larva covered the plant, I found myself being called by someone for help who is being stucked in a problem. And my concern towards the needy was very genuine and immediate. But when I had cured the disease I was happy for curing it but got shocked when I found the the thing that the patient I was curing was no more. There was only the soil and some half left roots n stems of the plant. I was very upset and don’t guess wat to do further. I was sure that I have lost someone truly worthy of being with me. But I was useless. I was so upset and hopeless that I impacted on my daily routine also. I was constantly thing of the scene whereever I go. Dayz passed and the incident left an ever lasting impact on me. My self often questioned me, argued with me and filled me with guilt. Why I did this? Was my intention unclear,untrue? One fine day I woke up late and started preparing for my college in a hurry. I brushed my teeth and flushed up in hurry. After bathing it’s my daily habit of washing my clothes and put them for drying in the corridors of my room. The place is just beside the hanging plant. I came out with wet hair on towel, rinsed the soaked clothes and as soon I placed them on the bars I suddenly noticed the plant. Initially i was surprised and then I was happy. Though I was late for my college but still I gave 2 minutes and gave some attention to the miracle. Yes it was a miracle because I don’t knew it’s reason. That day I was very happy and was filled with full of hopes. But the question remains the same that what made me amazed with that one scene? Even though I was late why did I gave 2 minutes? Why that 2 minutes gave me the happiness throughout the day?? There are many such questions that raised in my mind that day. That day I did all the classes, practicals and lived each moment with complete zeal. But u might be surprised that what actually happened that made me so happy!! So here it is. 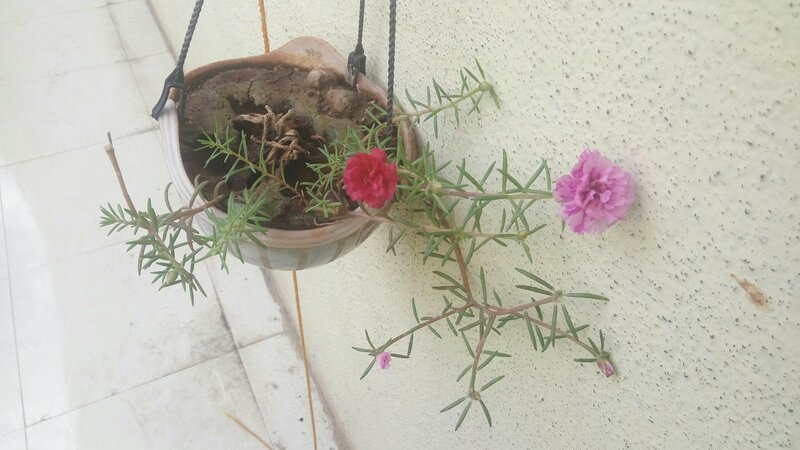 That morning when I saw the pot which I ruined by cutting stems and roots was enlightened with a small, new and fresh stem with green little leaves. there was no water from dayz, no special care, no fertilizer to nourish, even the original plant was destroyed by me thoroughly. But still a small little angel grew like a small ray of hope. It had nothing in favour neither the soil nor the condition but still it showed the courage to take a new birth in the worst condition. This is what amazed me. Because though whatever the conditions are in life either good or bad nothing remains constant and they won’t define you, but what’s constant is the nature of Growing!!! That day I made a firm commitment to myself that even if it’s the last day of my life still I’ll be happy to start a new innings. After that day I took good care of that small plant. I watered it daily and adequately. Someday later the small leaves grew into big stems as can be seen in the picture. Along with it some more stems also grew along with that stem. These were the children of the same roots that I have destroyed earlier. Ups and downs never define us they are just to design our destiny. Conditions, things and people are stationary don’t get attached with them. Even it’s the last day if my life I’ll still plant a new seed. Peep in your life and see your life with open eyes. See the beauty, happiness and joy. Don’t over exaggerate. Don’t close ur eyes when it’s the worst time. See the sadness, sorrow, sufferings, etc. Don’t lower when u suffer because they are not constant. It’s going to change. Equanimity is the path of Enlightenment. After that incident I always took care of my plants, people, my relations and mee of course. Because whatever happens what is good is always needed to be cared and not left…! Posted on June 5, 2017 January 19, 2018 Categories Personal13 Comments on It’s all about Growing!! !